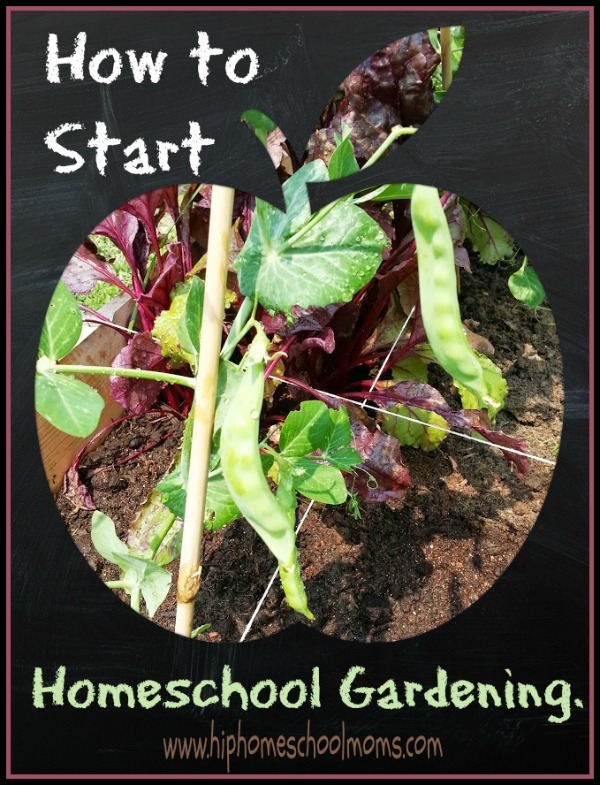 Now that it’s warming up outside you may be thinking about starting to do a little homeschool gardening. If you’ve been interested in gardening as part of your summer learning, I want to encourage you that it’s well worth the time and money you will invest. The educational opportunities in and of themselves are reason enough, but gardening also has many other benefits. Your family will naturally eat more healthy foods, and you will probably also save a little money on your grocery bill. Cultivate and offer experience for life lessons such as patience, nurturing and faithfulness, life cycle, reaping what you sow and much more! Teach in context science lessons such as PH levels, photosynthesis, etc. Teach applied mathematics such as calculating plant spacing using a square foot method or quantifying harvest and yield. Enhance your homeschool day by offering constructive break time to tend the garden. Add valuable learning time and “something constructive to do” during the summer months if you choose not to homeschool through summer. Enhance your health and offer healthy foods grown organically in your own backyard; with success it can supplement your food supply. Offer unlimited science lessons and experiments for botany. Multiply your unit study and field study opportunities for various gardening and agriculture topics. Increase possible field trip ideas to complement your learning. Enhance biography studies on various leaders in agriculture and plant science such as George Washington Carver or Gregor Mendel (Austrian monk who discovered basics of genetics through his garden experiments). Offer plenty of opportunity for problem solving. Kids will have to figure out how to keep rabbits out or how to protect tomatoes from an unexpected late frost. Slow your lifestyle pace down offering time for peaceful reflection. Offer the perfect observation study on environment or nature. There is no better way to understand your environment and learn about animals and their behaviors in your own backyard than to have and tend a garden. You can study everything about your little ecosystem-weather, insects, food chains, and more! Earthworms and ladybugs are a gardener’s best friends. 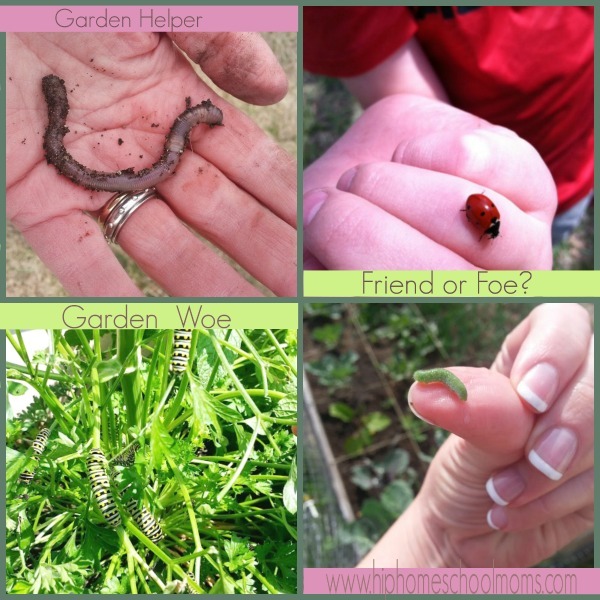 Your child will learn about these good critters as well as the ones that can destroy your garden such as black swallowtail caterpillars and “cabbage moth” larvae. Notice I added tend to the last reason. That’s because getting to know your backyard ecosystem takes time. It will require faithful dedication and consistency. During the course of at least one year, seeing all the seasonal changes, your child will get the best understanding of the plants and animals in your neighborhood. Weather study is also a factor because a good gardener will have to watch the weather forecast! 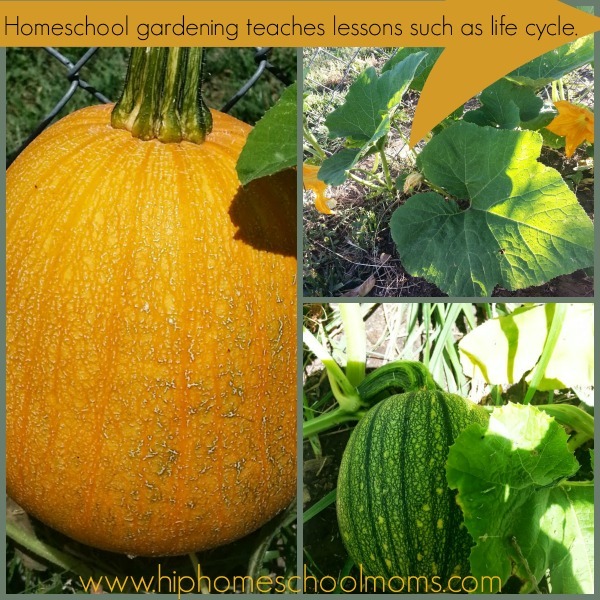 Understanding storms, rain, drought, and more and how they will affect your plants will enable your homeschool garden to grow to completion. My best advice to you when you start a homeschool garden is to invest in good soil and start your seeds in the ground outdoors. Having a raised box that you fill with your own soil mix will significantly reduce the majority of weeds and problems with crops not thriving due to malnutrition. 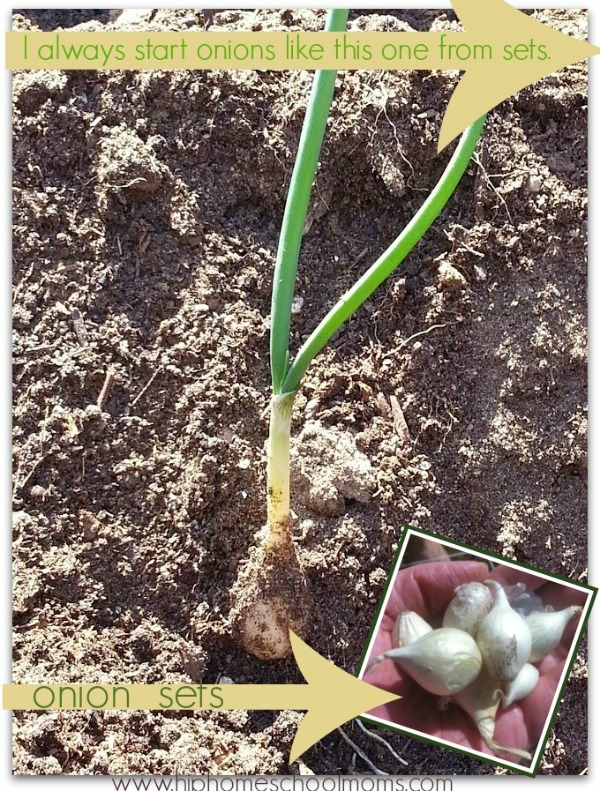 If you give your plants a good place to grow to begin with, it optimizes your chances of success right from the get go. It’s a great learning experience to start seeds indoors in order to view germination, but in terms of growing crops to harvest, I have found it is not worth the time. The seeds rarely make it because of lack of sun and the “hardening off process”- weatherizing plants that have been raised indoors is difficult. Therefore, sowing seeds right outdoors in the ground is the best course of action unless you have a greenhouse. After that, sunlight and watering faithfully are the second most important factors once things get planted. 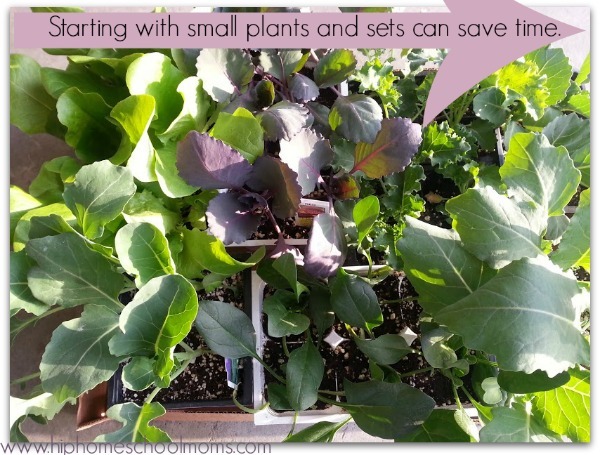 Starting with small plants will save you time and help you get a jump start for faster results if desired. I recommend starting with young plants for tomatoes, peppers, cabbage family plants, eggplant and strawberries, and onion sets for onions. Most other plants I begin from seed to save money. Just be sure to start them at the right time. This is how my garden looks right now. Even though it’s still early spring I’ve already had some things to address. Cabbage moths invaded last week and you can see a mesh barrier to keep out rabbits surrounding the box. You also need to know what kind of homeschool garden you want to have and then build the structures you’ll need to have it. What is your purpose and goal? 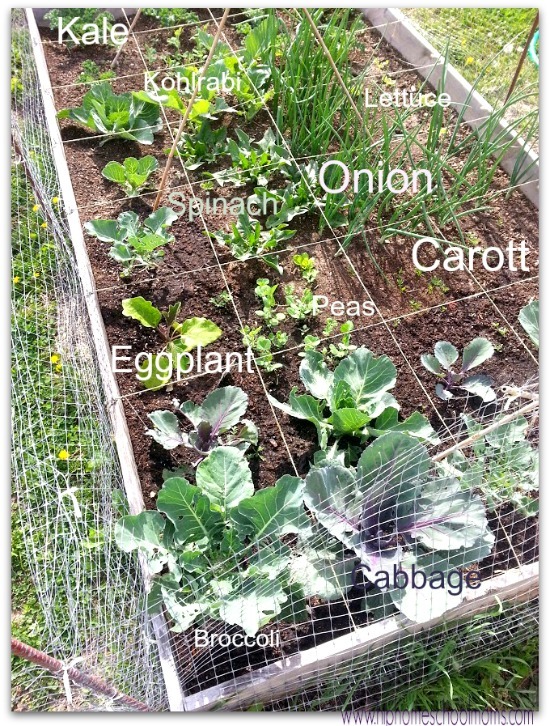 Do you wish to have food grown that you will use in your kitchen? Are you focused on a prayer garden and want to plant flowers and plants to create a peaceful environment? Are you going to use taxonomy to teach your child how to categorize plants the way scientists do? Decide your purpose and then begin planing your garden. Include your child in the planning process. What type of garden you plan to have will also be a factor in the location of your garden. If your intent is to grow food, then your garden must be located where it will receive 8 hours of sunlight. Take into consideration that in early spring most trees don’t yet have leaves. You must think about where shade will be at different times of year and of the day. Because of this, my garden boxes are in the middle of my yard. Not as ideal for mowing and for looks. But because my priority is success and not looks, I can live with a box in the middle. This is where I can guarantee proper sunlight for my food bearing plants. timing- plant for your zone and for the plant’s needs. For example, lettuce and cabbages can be planted very early- they like it cool. But you must wait till after the last frost for tomatoes and basil. More than anything, gardens need care, so be prepared to start small and plant only what you can nurture long term. The biggest mistake people make is planting more than what they can tend.They get overwhelmed mid summer and give up. Gardens start so very small and become so very big. It’s part of the lesson to see something with such a small start grow into something so great. So don’t over plant. Though they didn’t mature fast enough last year ( I started them from seed) the bees on my tomatillos reminded me of the importance of my labor. I guess homeschoolers do have homework after all. Moms are busy and we plan and do so very much. Please don’t get overwhelmed, but do the work. Read a little, make it as enjoyable as you can. As I said before, start small. A good garden takes at least 5 years to get established. Start with one thing and build on it each year. Don’t bite off more than you can chew. Rotate crops each year and plant different things in different places. I use the square foot method which makes this automatic. 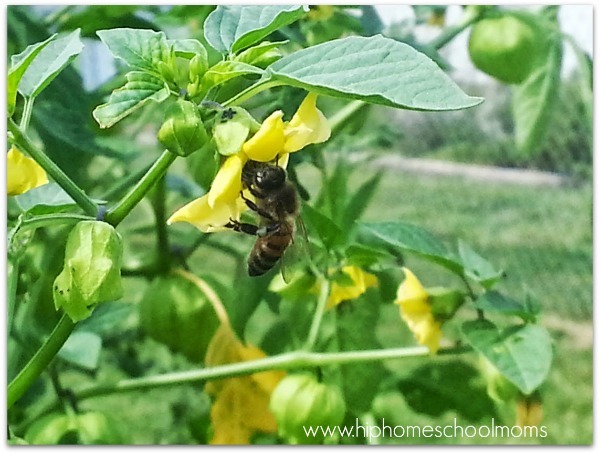 What other types of Homeschool Gardening can you think of? Share with me any garden ideas you have for this year. How do you get your kids involved? 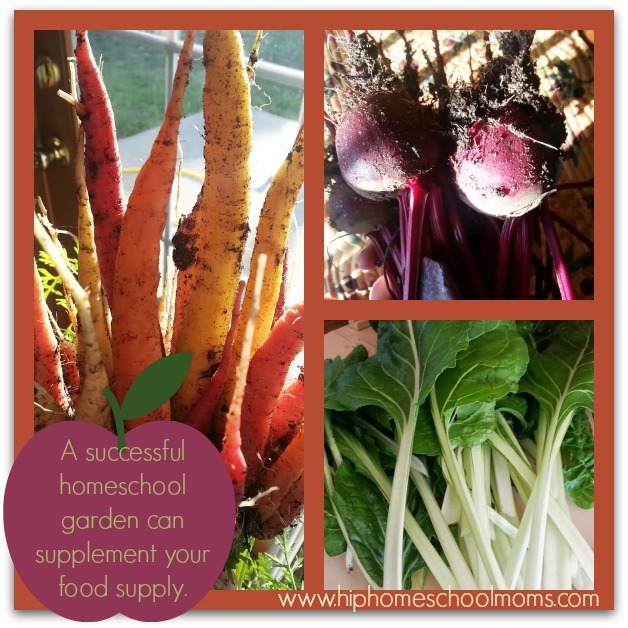 If you don’t have a homeschool garden yet, what is holding you back? Though I am only a hobby gardener, feel free to ask any questions about gardening, and I will do my best to answer them! Some great ideas and resources~Thank you so much!!! Great resources here, Stephanie! i’ll be pinning this to my gardening board. 😉 Thank you for including my link. You are welcome! It was a lovely message- something we learn when we garden. 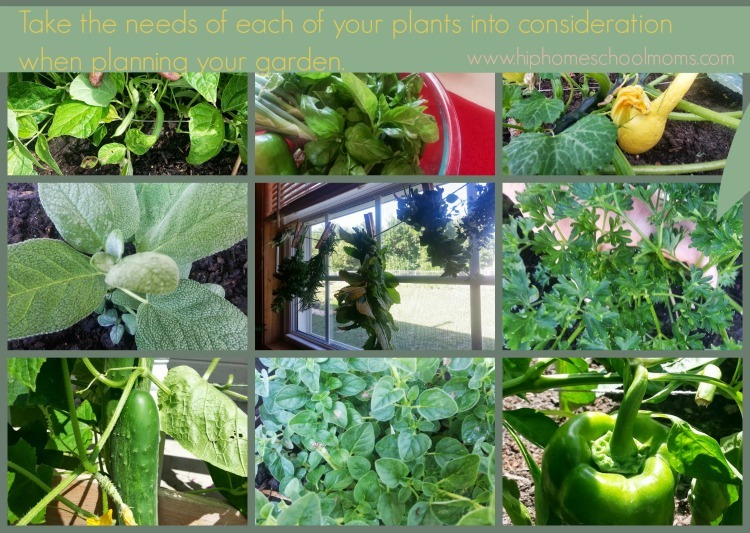 I think you have many good ideas for gardening and homeschool gardens. One type of garden that my family has planted is the butterfly/hummingbird garden. We planted it where we can see it from the front window and it has brought much joy to all of our lives. We have learned many, many things about butterflies, caterpillars, chrysalids, wasps (which hunt caterpillars for food for their young), butterfly host plants, and nectar plants for both hummingbirds and butterflies. Attracting birds, butterflies, and other wildlife are great reasons to garden!